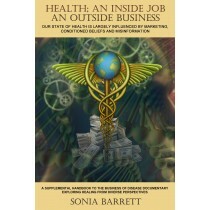 HEALTH; AN INSIDE JOB AND OUTSIDE BUSINESS, WAS WRITTEN IN SUPPORT OF THE DOCUMENTARY THE BUSINESS OF DISEASE PRODUCED BY SONIA BARRETT. EACH CHAPTER HAS BEEN A CONTRIBUTION BY THOSE FEATURED IN THE FILM. THESE EXPANSIVE MINDS BRING TO OUR ATTENTION THE HYPNOSIS OF MARKETING, BELIEF SYSTEMS AND THE BODY’S ABILITY TO HEAL. Not only do they shed light on the disinformation presented as health care but they have integrated science as a means of clarifying the possibilities which exists in better understanding the inner technology of spirit, mind and body. Through a holistic approach in dealing with dis-ease, options and insights are presented as readers are encouraged to examine the whole person. The marketing of dis-ease is examined along with the genetic and social programs from which our choices and experiences are shaped. We are encouraged to be unafraid to take responsibility for our bodies, our spirits and our minds. Collectively they bridge the gap between science and spirituality in a way that truly brings to light what is possible. These are voices of freedom for those ready to leap into a new level of inner freedom. External change begins with an inner revolution. Physicist, Dr. Amit Goswami uses quantum physics to explain the healing power of integral medicine. He poses another question, “Where is the discernible signature of [your] choice then?” Where is the seat of your power to create? Dr. Romeo Brooks reminds us that; “Simply put, disease is a struggle. It is a struggle that the body engages in on its own behalf. It is a struggle of intent and precision. No matter what it looks like, no matter what course of action the body takes, no matter how radical the symptoms may appear, its survival is at hand.” Through these pages the struggle in your own life becomes clear and perhaps providing you with insight into your own body’s dis-ease.